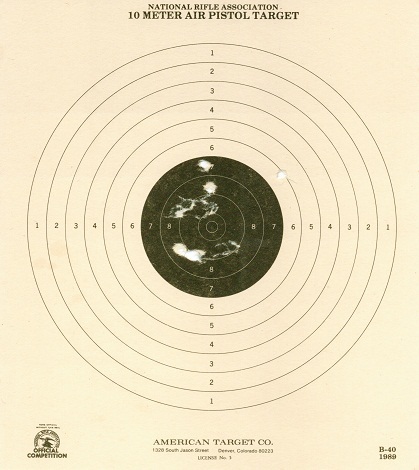 When I'm shooting with iron sights I tend to get vertical lines of shots, as with the attached (the first two shots were the leftmost 8s, I adjusted the sight right). There are 10-11 shots in that target. This is very typical for me, especially when shooting my air pistol - shots that span about the 9 ring horizontally, but the entire bull vertically. I do not shoot that way with my red dot sight. Any diagnosis? I'm thinking I'm loosing track of the front/back blade alignment. Right now I'm doing a 6 hold, so perhaps either I'm not doing well with that alignment, or a little too much focus on the front/bull lineup is making me lose the front/back alignment. I can't call my vertical errors, but I can call when I shoot left/right, or that 6 flyer in the upper right. Anyway, that seems to be the likely problem to me, but perhaps it's a trigger, grip, stance, etc., problem. I dunno, I'm still fairly new to pistols. Any ideas, or ways to figure out what the problem is? One possible cause can be what is sometimes called "mid ranging". This is where you visual focus tends to drift somewhere out between the front sight and target. This is hard to detect, until you become aware that this is possible. After a shot that was higher than your call, play back the shot in your mind as see if your focus drifted. Ensuring you are actually focused on the very top of the front sight may also minimize your vertical stringing. When you think about it, the top of the front sight blade contains all the information you need - (i.e., both vertical and horizontal alignment). I have seen some shooters also place a small mark on the rear portion of the front sight near the top so that the eye has something to focus on. I agree with slocat that you may be optically "hopping" between the front sight, the target or anywhere/somewhere in between. My ability to remember the snapshot of my sight alignment saved by my brain at the moment the shot broke provides me with the best diagnosis. When I cannot clearly recall how the sights were aligned, chances are good my focus was somewhere other than where it should have been. If I am not calling my shots pretty accurately, it's even more likely my focus was not on the front sight when the shot broke. The two of you are probably right. I spend a lot of time worrying that the top of the front sight is lined up with the bottom of the bull (I know that a big reason for sub 6 hold, but so far that hasn't worked for me). I'll work on this dry firing against a blank wall. This is where center hold or sub-six would work better. Your eyes are trying to move focus too much most likely. The diabolical thing about shooting irons is having to master the technique of completely ignoring the very same thing you want most in the world to hit - the bull. I went to the range tonight and set up a pistol for center hold for our international league which is starting tomorrow. We will see how that works for me in the next few weeks. I get a lot of horizontal error in sub 6 shooting which is how I fell into the 6 hold. I also shot a few strings with my .45 and printed an almost identical target to the one I posted above. Interestingly, my horizontal error with irons is much smaller than with a red dot. I just noticed something about the new to me .22 that I bought over the weekend. There's a notch in the front blade that is colored in that is "just" visible in the bottom of the rear blade's notch when the sights are aligned correctly. Dry firing while ignoring the rear blade (just watching the front sight and its line) show me this line is jumping up and down when I release the shot. Houston, we have a problem. edit: the fact that I just discovered this feature is another clue, I should think. You must see the front sight and nothing but. Whatever it takes to stay on the front sight. Frame it in the rear sight notch. Your steadiness, vision, lighting conditions, notch and blade width and notch depth all can make it easier to see the front sight. Have you tried the technique of smoking the front sight, smoke or spray. Then putting a scratch in the smoke. This gives you something to focus on. Having something on the front sight to focus on will do a lot to prevent your focus wandering to other places. This is something -- midranging -- that I am very guilty of as well. I have a tendency to put my shots high when I'm doing it. I've gotten so good at it that I would swear I'm not doing it! I'm pretty good at calling my shots, and when I call the shot as having been good and it wasn't, that's my warning bell that I have started midranging and am not watching the front sight at the critical time, allowing my subconscious to twitch the gun. I haven't smoked it as you describe it - but I did put white out on another gun, then scratched it all off with my fingernail - it left just enough color to give my eye something to focus on. I'm also noticing I blink during the particularly bad shot. 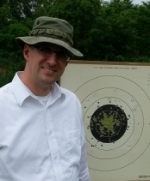 The front sight is right at the range that my eye can't focus well (the rear sight is always in perfect focus if I focus naturally, as I'm near sighted in that eye). That's not an excuse, but something I need to be aware of and fight. I refuse to use those international style glasses, but perhaps a shooting prescription in a regular pair of safety glasses is the way to go. But yes, last night I noticed myself midranging when I wasn't holding it together. Do you normally wear corrective lenses? The last glasses that I had were 1/2 diopter different than the ones I have now, and I see better with my new ones, but when I focus on the front blade, the bull is soooo dim that I cant see it. My old perscription allows me to still focus on the front blade, but the fuzzy bull is dark enough for me to see it. I use pumpkin on a post. If you don't have corrective lenses now, and want to keep wearing the same safety glasses, you could get a perscription for some very weak contact lenzes. The right optomatrist might give you samples of different power that you could try at the range. It's easier and cheaper to do that with contacts then glasses. I am nearsighted in the right eye, and far sighted in the left. Almost perfect for bullseye!, except my right eye makes the rear sight perfectly sharp, and it takes work and concentration to get the front sight sharp. Some days it just never happens, sometimes it is pretty easy. I have a pair of glasses made for computer use (my day job) but they put the bullseye into a complete blur. In any case I've weeded out a lot of this vertical error just by being aware of the mistakes I'm doing.